It's full steam ahead once again for Thomas, the little blue engine with the short stumpy funnel, short stumpy boiler and short stumpy dome. Share 9 exciting new adventures with Thomas and his friends, Gordon, Henry, James, Percy, Edward, Toby, Annie and Clarabel the coaches, and of course the Fat Controller. Thomas's special friend, story-teller Ringo Starr says "Thomas is a smashing little engine - he's Number One and never lets anyone forget it!" 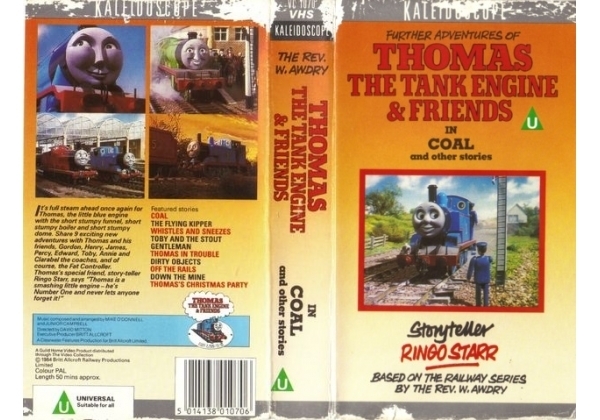 Or find "Further Adventures of Thomas the Tank Engine and Friends: Coal an" on VHS and DVD / BluRay at Amazon.